Dutch Barge Luxe Motor New Conversion From 2003 To 2013. 1 engine AIFO(FIAT –IVECO) 135 HP, 3 730 hours as of 27/04/2018. Cooled by heat exchanger. Engine age is unknown but was bought in 2003 as a reconditioned unit. The main engine is off center and drives a shaft drive via belts from a VELVET DRIVE gear box. Speed on canal = 3 knots running at 1500 rpm, 5 lt/hr consumption. Speed on river = 5 knots running at 1700 tours, 8-10 lt/hr consumption. 2 alternators. One for the main engine, one for the service batteries. 1 charger inverter VICTRON 24 V/ 5000 VA /120 AMP, manages the electricity needs and changes automatically from shore power to generator to batteries as necessary. 4 batteries : 2 providing 24 V for starting the engine, 1 x 12 V for starting the bow thruster, 1 x 1050 A/h for the service. The generator is a MITSUBISHI, purchased new in 2004, 11.5 kVa. The original soundproofing box has been replaced by a superior unit for best noise reduction. 1 electric meter in the engine room, for the times when the electricity is not provided by a marina. 1 bow thruster powered by a SOLE DIESEL engine, new in 2013. A service manual of the boat is available as are the wiring diagrams. Luxemotor type barge built in 1912, by the Joseph BOEL & ZONEN yard in Belgium. The current owners have undertaken a total rebuild (New bottom up!!) which took 10 years to achieve with everything revisited. New bottom, engine, technical installations and refit. Her dimensions allow for great interior living space whilst facilitationg easy navigation. The hull has been totally replaced from the forward peak watertight hulkhead to the middle of the engine room. The rest was overplated. These works were professionally done from 2000 to 2003. The superstructure has been insulated with spray foam in 2010. 3 watertight bulkheads divide the barge in 4 spaces. The first watertight bulkhead is situated between the forward peak and the main living accommodation. The two others are on each side of the engine room. Access to the forward peak by a outside hatch and a ladder, access to the aft peak by a hatch in the aft cabin floor. In the forward peak : the bow thruster, the saniflo (receiving the waste water from the 2 forward cabins), the anchor locker, a tank of 1400 liters, full of water for the moment (ballast) but able to become the holding tank if required. Excellent storage for ropes, fenders etc. The engine room is well sound proofed using thick industrial foam. There is full standing headroom and a CCTV camera to a screen in the wheelhouse allowing constant surveillance of the machinery from the helm. In the aft peak, are the hot water tank, the exhaust gas cooling, the belt drive and the propeller shaft. Another CCTV camera controls this space. The wheelhouse windows fold to pass under low bridges. The front and back windows hinge down, the sides and the wheelhouse roof can be dismantled and kept on deck. The air draft is 3.45 meters wheelhouse up and less than 2.60 wheelhouse down. 2 gas bottles are kept in the gas locker on the aft deck. No steps on the side decks. Last hull sounding done in 2009. Renewal of the TRIWV in 2019. 4 steps down aft to aft cabin reserved for the moment for the guests, with an Italian shower and basin, centre bed & separate WC. Windows were built especially in India. 1 smoke detector in the corridor. The kitchen is organized in a U form on starboard : 1 fridge-freezer, 1 oven-grill, 1 five burner hob (gas) with extractor, 1 sink, 1 dishwasher, many cupboards, 1 table, 4 chairs. 2 steps lower, is the saloon. Bright airy and convivial I was impressed by the feeling of space and comfort & yet cosy atmosphere. Long table with chairs and armchairs. Preparation for wood or multifuel stove to be installed if required. 2 little steps lower forward are the twin cabins each decorated differently but with the same specifications. Each cabin has its storage furniture, wardrobe, cupboard and a wet-room with a shower, basin, electric toilet and cupboard. From the kitchen, going back, 4 steps leads to the laundry room equipped with a washing machine, a dryer. The main electrics panel is also situated in this area. From here, crouching, a large half height space under the kitchen floor with room to store much equipment and tools. Concrete ballast is visible here, and is movable (not poured). Wood floors and head linings give a warm and cosy feeling. I felt immediately at home, comfortable & at ease! Headrooms in METERS : Wheelhouse: 2.00 – galley : 1.97 - Saloon : 2.00 - forward Cabines : 1.95 - forward heads : 2 m – aft guests cabin : 1.95 - guests head : 2.00. A WIESMAN boiler provides the warm water to a tank of 150 liters and heating to radiators throughout the boat. A water treatment station provides an unlimited supply of water for all the barge, although our vendors do not use it for drinking. Please note that some items of furniture and decoration seen in our photos are not included in the sale. There is an emergency steering spigot on the aft deck but no tiller is available. Register with Boatshed to see 179 extra photos of this Dutch Barge Luxe Motor New Conversion From 2003 To 2013. Boatshed Bourgogne is happy to offer this LUXEMOTOR, dutch barge for sale in France, built in 1912 in the Josef BOEL & ZONEN yard in Belgium. A high quality conversion this is a rare quality liveaboard barge ideal as a pied-à-terre in France or a cruising home able to visit and cruise the Canal du Midi and all Freycinet size waterways. I have to say I was really impressed!! This barge is a great success and a credit to her owners both for the sensible, quality conversion and the high standard of maintenance they have kept ever since. Well thought out, well built & well maintained. I can see this as a great family home. A superbe holiday home for Francophiles from everywhere or even has professional possibilities (subject to the usual permits). Certificat communautaire valid until may 2019 will be renew this Spring 2019. 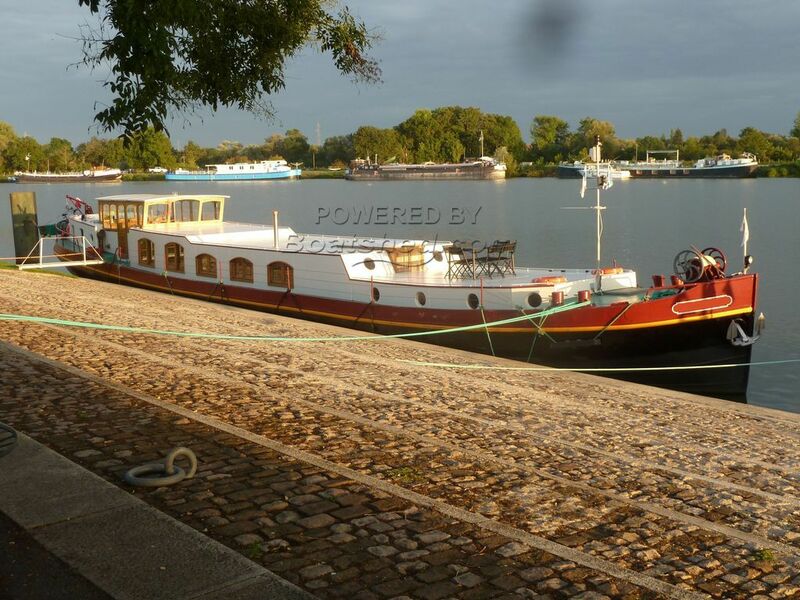 This Dutch Barge Luxe Motor New Conversion From 2003 To 2013. has been personally photographed and viewed by Cathy BOUGUEREAU of Boatshed Bourgogne. Click here for contact details.